It's a huge decision, choosing a material for your kitchen countertop. Huge both in terms of cost and in their impact on the aesthetics and practical function of your kitchen. Top-end, premium kitchen countertop materials are a significant part of a kitchen remodeling budget. A well-chosen countertop makes your kitchen more useful and easier to maintain, and it can also serve as an important design element of your kitchen. The range of materials that can be used for kitchen countertops is amazingly diverse, and some materials on the list may be surprising to you. Each material has its advantages and disadvantages, all of which need to be weighed when choosing. The more esoteric materials, such as bamboo, zinc, and stainless steel. may prove to be too expensive and hard to maintain for most people. For most homeowners, the more practical options will include materials such as slab granite, engineered stone (quartz), solid surface material, as well as traditional laminates and ceramic tile. But rule nothing out until you learn a little more about each option. Laminate countertops are one of the most affordable options. Installation is an easy DIY project when you install pre-fabricated (post-form) countertop sections. Great variety is possible if you build a countertop from scratch using designer laminates. Thousands of colors and patterns are available. Laminates are considered "cheap" by some home buyers; they may be a drawback when you try to sell your home. Laminates can peel up, chip, and scorch easily. Laminate countertops can feel hollow and lightweight compared to other materials. Ceramic tile countertops are made from individual clay-based tiles adhered over a cement-board core using thin-set mortar adhesives. For kitchen countertops, grout seams make tile a less-than-ideal countertop material, but newer ceramic and porcelain tiles are available in large sizes (1 x 2 or 2 x 2 feet) that can help minimize the number of seams and make for easier upkeep. Tile is second only to laminate as an inexpensive countertop material. Ceramic tile is relatively easy for a DIYer to install. Modern porcelain types offer diverse design options—porcelain tiles can look like natural wood, real stone, and many other materials. Grout seams are easily stained and are hard to clean. Ceramic tile is brittle and prone to cracking. Repair is difficult, requiring full replacement of damaged tiles. Many types of natural stone are popular choices for a kitchen countertop, and of these, the most popular option is a countertop made from a solid slab of granite. Beginning life as a quarried slab of solid natural stone, granite countertops are fabricated to specification and installed by professional crews. Solid granite slabs make very heavy and durable countertops. No two pieces of granite are alike, making each countertop entirely unique. Considered a premium building material, granite countertops tend to improve home real estate values. No-seam countertops are usually possible. Granite is a fairly expensive material. Like many other types of natural stone, granite requires periodic sealing in order to protect it from stains. Granite is not a DIY-friendly material—it must be installed by pros. Possible to install by a homeowner. The hardest part is hefting the slabs around. Inexpensive by granite countertop standards. These countertops will still have some seams and will not look like solid slabs. Modular slabs are considerably thinner than solid slabs, and they can be cracked or broken. Like solid granite, period sealing is necessary to protect against stains. Granite tiles offer some degree of prestige, though not the same as solid stone slabs. Can be installed by a homeowner in a weekend or two. Granite tile is the cheapest and easiest of the granite options. Will be easily recognized as a DIY countertop by prospective home buyers. Tiles are thinner than slabs or modular granite, and hence more susceptible to breaking and cracking. The many grout seams can be easily stained and are difficult to clean. Like all natural stone, granite tiles must be periodically sealed to protect them against stains. Another natural stone option that is in high demand for countertops is marble, although it has limitations that should be recognized in kitchen applications. Marble's unique appearance and veined patterns make it one of the most attractive of all natural stones. But marble is a relatively soft and porous stone that MUST be carefully and repeatedly sealed if used for kitchen countertops. Like granite, marble is available in three forms—solid slabs, modular marble, and marble tiles. As with granite, solid slabs are the best choice for countertops. Marble has a natural veining that makes it the most beautiful of all natural stone. Because each slab has slightly different veining, each marble countertop will be entirely unique. Marble is porous and can be easily stained unless it is regularly sealed with a top-quality sealing product. A relatively soft stone, marble is easily scratched by knives and other kitchen utensils. Like most natural stone, marble is a rather expensive material for large expanses. Although not as well known as granite or marble, soapstone has been used for countertops for many years. Another quarried stone, soapstone has a warm, milky appearance that allows it to complement other design features without overwhelming them. Soapstone is usually found in varying tones of whites and grays, and it lies in between granite and marble in terms of hardness—not as hard as granite, but less porous than marble. Soapstone has a warm feeling and milky look, due to the high amount of talc in the stone. These countertops give kitchens an antique look. Less porous than other stone, soapstone resists stains and is fairly easy to clean. While harder than you might think, soapstone can be gouged and scratched. Soapstone is rather expensive, sometimes costing more than granite. These countertops should be oiled periodically to maintain their patina. Colors are limited to mostly shades of white and gray. Soapstone is a somewhat rare material for countertops, making it a pricey option but one that some homeowners may enjoy for its uniqueness. The final natural stone commonly found in countertops is slate, which is quarried straight from the earth, cut into slabs, and surface-grinded to a matte finish. It is a surprisingly good material for countertops since it is relatively non-porous and resists stains well. Although most people think of slate as a dark gray or black stone, there are types that have shades of green or pink within them. Unlike soapstone, slate has some subtle veining, though less dramatically than marble. Slate is non-porous and resists stains well. Slate resists bacteria very well. A hard, durable stone, slate countertops hold up very well. Slate is usually less costly than granite, marble, or soapstone. Slate does have a gritty, matte texture that may not be well-suited for many kitchen preparation applications. There are fewer color options than with other materials. Slate countertops warrant consideration for homeowners looking for something unusual but subtle. There are surprisingly few downsides to slate countertops. Solid surface is a manmade material originally created as an alternative to stone, designed to resemble granite and other natural stone. It is made mostly of blends of synthetic acrylic and polyester materials, sometimes with a small amount of natural stone dust blended in. The material is held together with resins and shaped into slabs for use in countertops. The material can also be molded into one-piece units with sinks integrated into the countertop. Solid-surface countertops are more affordable than natural stone and engineered quartz. The appearance gives a good simulation of granite or quartz. Minor scratches can be sanded or buffed out with fine sandpaper. Hundreds of colors and patterns are available, making this a very versatile material for kitchen design. Solid surface materials are prone to scorching and scratching. 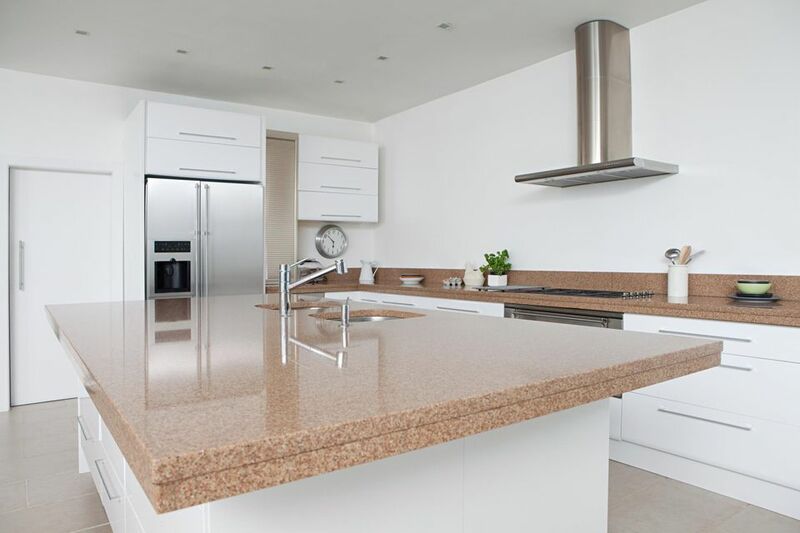 Once regarded as an upper-end material, solid-surface is now often seen as a cheaper alternative to engineered stone products such as quartz. Solid surface countertops are very versatile and give a reasonable and much more affordable alternative to granite and engineered quartz. They're not difficult to clean either. Explore the best solid surface brands. Quartz countertops are one of the latest and greatest manmade countertop materials, made popular by brands such as Dupont Zodiaq and Cambria. This material is composed of pulverized waste rock plus resins for hardness and binding. Thus, "quartz" countertops are not solid slabs of quartz mineral but instead are an engineered stone product. Many quartz counters have antibacterial agents added. Quartz is rapidly overcoming solid-surface material as a convincing alternative to natural stone for countertops. These are very beautiful countertops due to the inclusion of quartz crystals and other natural minerals. Quartz countertops are highly sought after, creating high resale value in a home. These countertops are more durable and less susceptible to scratching than a solid surface. Quartz countertops are exceedingly heavy. Quartz countertops are quite expensive—on a par with natural granite. Must be installed only be experienced installers. There is no DIY option. Quartz countertops offer the best of all worlds—a countertop with the beauty of natural stone and the flexibility of solid-surface material. Concrete countertops are a great conversation piece: everyone who visits your home will comment on them. Concrete can be shaped to fit any size. Concrete countertop​s are very, very heavy, requiring special bracing. These are very expensive countertops, requiring the work of custom craftsmen. Concrete countertops are not for everyone, but they may be appropriate for very high-end homes where a truly unique, modern look is required. Featuring recycled glass, these are very green products. Vetrazzo, a major glass slab maker, uses 85 percent glass by volume in their slabs, of which 100 percent is recycled. These are hard and non-absorbent countertops that resistant to stains and easy to clean. Many unique colors and patterns are available. Recycled glass slab countertops are a specialized material, often hard to obtain. Few companies know how to fabricate glass slab counters; they must be certified. These are very costly countertops. This is an Inexpensive way to get recycled glass on your kitchen countertops. Unlike recycled glass slabs, laying tile is a good DIY project. Seams between tiles are subject to staining. Glass is a brittle material, prone to breaking, chipping, cracking. Glass tile s are not durable enough for kitchen countertop use and should be used instead for backsplashes. New, high-tensile glass can also be formed into slabs for countertops. The result will be a truly unique countertop with a number of virtues. Glass is one of the very best materials for resisting bacteria (and easy to clean). A high-tensile glass is heat-, scratch-, mold-, and stain-resistant. These countertops have an unusual and captivating look that cannot be duplicated by any other countertop material. While glass countertops do have high tensile strength, they are still glass—and can crack. Few countertop fabricators are equipped to install this special material. Stainless steel kitchen countertops have now officially left the restaurant and entered the home. They are normally custom fabricated to precise specifications and installed by custom craftsmen. Stainless steel is germ-resistant and very sanitary. In the right kitchen design, these can be very beautiful countertops. Stainless steel is a very expensive countertop option. Difficult to fabricate, stainless steel requires specialty workmanship that may be difficult to find. Prohibitively expensive for most people, stainless steel is really suitable only for upper-end homes where the look of a commercial kitchen is desired. Innovative manufacturers are constantly experimenting with new materials, and one such countertop is commonly called paper, although more accurately these should be considered paper composite countertops since they made of paper heavily impregnated with resins. This can be considered a "green," eco-friendly alternative to that other more common composite countertops—laminate. Even the resins in these products are green—plant-based rather than petroleum-based. Not readily available at your local kitchen design center, these will require a special order. Fabricators and installers are unfamiliar with the product and may be reluctant to work with it. The time may not yet be right for paper countertops. Because this is a special order item, prices are high and supplies are limited. This is for the adventurous homeowner who wants to try a truly unique, and somewhat unproven, countertop material. If you imagine that aluminum countertops resemble solid metal surfaces like commercial stainless steel counters, you're quite wrong. Aluminum countertops are closer to quartz (engineered stone) or solid surface than to stainless steel. They are made of waste aluminum flake, solid surface scrap, and recycled acrylic. The aluminum flakes are added in for appearance, not to create a homogeneous surface. These countertops consist of up to 97 percent recycled content. They create a sleek, contemporary style. The product is truly eco-friendly, using no VOCs. Recycled aluminum countertops are expensive and still rare in residential applications. Although an interesting new material, recycle aluminum countertops are somewhat unproven for now. Only time will tell if this will be the next engineered quartz. You can take green remodeling a step further by installing reclaimed wood counters. Barns, flooring, siding, and yes, even old wood counters, are repurposed and made into wood counters for an antique and truly unique look. Look in architectural salvage yards for raw materials. Wood countertops are the epitome of green and eco-friendly. These are highly unique countertops for a kitchen—a conversation piece. Imparts a classic look in your kitchen. Requires some research and legwork to find the right materials. Wood requires significant sealing with tung oil. Craft Art recommends that a certified service provider does this. If not carefully maintained and sealed, wood countertops can harbor germs. This is a questionable choice for kitchen countertops. With wood being an organic material that does not mix well with water, most homeowners envision rotting, moldy wood that needs to be replaced after a few years of use. That vision is partly true: if you don't keep up on the constant maintenance, wood will rot quickly. Are you willing to take on the upkeep? Another unusual countertop surface is zinc—formed by applying zinc sheets over a base core material. Found fairly often in bars and other commercial settings, zinc kitchen countertops are a rare sight. Zinc makes an absolutely unique countertop—yours will be one-of-a-kind. Scratches can be sanded out. The metal achieves a beautiful patina through age and wear. Zinc is softer than stainless steel. Zinc countertops are a specialty item requiring custom (and expensive) fabrication. Zinc countertops may be found frequently in Ernest Hemingway novels set in Paris bars, but the high cost makes them impractical for most residential kitchens. A very unusual material for kitchen countertops is bamboo. Although often lumped together with wood, bamboo is actually a grass, and the slabs used in countertops are made from shredded bamboo fibers blended with resins. Bamboo is a very hard substance, and in many ways is better than wood for countertop use. This is an eco-friendly material—bamboo is a completely renewable resource. Countertops have an attractive wood-like appearance. Bamboo countertops are harder than natural wood. The product relies on a significant volume of synthetic adhesives to create a solid surface. There is often a long lead time for delivery and fabrication, as bamboo countertops are still a rare item. Bamboo gives your countertops "green" cachet, but this material is difficult to find.